Crashed freighters, floating islands, and giant avocados. I’m addicted to No Man’s Sky all over again. Since the Next update I’ve sunk ten hours into Hello Games’ colourful space game, and I’ve been taking snaps along the way with the excellent photo mode. Here are my personal highlights. This was my view the instant I warped into this system. That pristine, Earth-like world and its dazzling rings set against the piercing red of space stopped me in my tracks. If this was the cover of a sci-fi book I’d read it. I’ve never seen a planet like this. A vast, endless ocean dotted with small, scattered islands, some of which were perfectly round, as if they were man-made. And on one of them, a lonely tree. There are a lot of rocks in No Man’s Sky, but this one stuck out. I like it when the algorithm throws up a shape like this that looks kinda unnatural on the horizon. I spotted this thing miles away and just had to take a closer look. Floating islands like these are quite common, but there was something about the size and shape of this one that caught my eye. I love how ominous it looks just looming there silently against that burning orange sky. Officially the biggest living thing I’ve encountered in No Man’s Sky. This lush, lively planet was covered in weird, enormous plants, but these were my favourite. I was half expecting it to eat me, but thankfully it didn’t. There’s something striking about seeing a bunch of planets in close proximity to each other. The one at the bottom-left of the screenshot is the water world I mentioned earlier. I think I’ll make this my home system. No Man’s Sky is defined by its vivid colours, but sometimes you’ll jump into a system like this. It’s a nice change of scenery and gives you an idea of what it might’ve looked like if Hello went for a more trad sci-fi aesthetic. Another cool rock, this time shaped like a scooped-out avocado, but one made of stone and roughly the size of a skyscraper. I don’t know if shapes like this are an accident, but I’m glad the algorithm occasionally coughs them up. I mean, look at it. What a view. I began a creative mode save and this was my starting planet, so I didn’t even have to look for it. The game just handed it to me. Another one that could be the cover of a vintage sci-fi novel. I don’t spend much time for looking for interesting creatures in No Man’s Sky, but I had to snap this guy. He was aggressive too, so moments after I took this he charged at me. Looks like someone skipped head day. Boiling hot rainstorms every minute made being stranded on this planet with no thruster fuel a bloody nightmare. But surviving, gathering enough resources to craft some, and escaping was immensely satisfying. This is one of the most bizarre and otherworldly planets I've landed on, covered in floating purple spores and the strange plants pictured above. I mean, I assume they're plants. They could be intelligent life for all I know. There’s something evocative about the image of a crashed starship. This one was absolutely massive, although I was in creative mode so I didn’t feel the need to go down and scavenge. I wonder what I would’ve found. Similar to Chris’s depressing planet, this place seemed to change the entire colour palette of the game. The planet itself was kinda boring and lifeless, but the fiery colour scheme was cool to look at for a while. I found myself flying over this enormous planetary ring as the sun set over it, which was like something out of one of Roy Batty’s dying memories. The entire game is basically a procedural Roy Batty memory generator. I love a good canyon, and this one felt particularly deep and wide when I stood on the edge. See that little starship flying through it? That’s a pal I was playing multiplayer with, which should give you a sense of its scale. 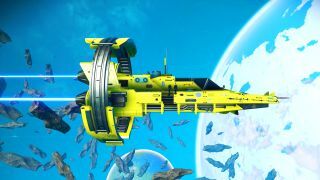 I found this dazzlingly yellow ship sitting in the middle of a green field, and I’m glad I was in creative mode so I could easily repair it and take it for myself. That ring around the engines is such a cool design element. This reminds me of when the Nostromo approaches LV-426 in Alien. There's something intimidating about this planet, shrouded in darkness, floating in a dark void. But when I landed it was actually quite nice. This looked impressive from orbit, and when I swooped down I discovered that it was a giant floating island that was a few miles wide, covered in minerals ripe for mining. For some reason it reminds me of a giant game controller. This desert had some really nice rock formations. I seem to land on a lot of desert worlds, but I love them. They usually have long, uninterrupted lines of sight, which makes the universe feel somehow more massive.